Well fellow financial farmers an investor after my own heart has finally codified what we have intrinsically know for years; that it is possible to achieve high returns from low risk. How? Frequent readers of this blog (thanks Mom & Nana!) know that the effects of compounding create a virtuous anomaly in investment returns. This alpha anomaly is the result of exponential returns from consistently adding shares via dividends, buybacks, and other shareholder-friendly actions which are natural occurrences when consistent strong cash flows are administered by prudent corporate management. 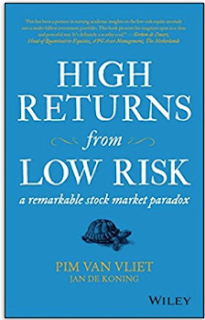 Pim Van Vliet goes back many decades and crunches the numbers for us to prove this point in his new book "High Returns from Low Risk." He compares high volatility stocks with low volatility stocks (referred to as "beta" in the Wall Street world.) From this he backtests multiple scenarios which pictorially reveal what happens to "boring" investors over time...although even those dice-throwing, card-counting, wheel-spinning risky investors do well too IF they have the ability to HOLD positions over long periods of time. What's the take-away? Invest for the REAL long time and don't be afraid to put money in your financial farm in positions which have traditionally been labeled "boring." This book is a great read for those who wish to Invest Like A Farmer.